Spring has sprung! Well...sort of...that's what it feels like these last few days. Last week was another story. I think it snowed a little bit every day...just to anger me. For now the sun is shining, snow removal is in the works (yes you heard me right) and it's 5*C, woohoo! I'm itching to get back on my bike and hit some trails. Le sigh. At least Spring is making promises. Let's just pretend it's not supposed to snow tomorrow mmmmk? Good. First I have some news to share. I've finally created a facebook fan page for edible sound bites. If you'd like to follow me you can find the link to the side of the page under the Subscribe & Follow heading. Please follow, I'd love to hear your feedback if your a fan! The second bit of news is a little more exciting; I've been choosing from a select few to appear in the next FOODIE iPad Cookbook App. My recipe for Maple Cinnamon Almond Butter will be featured along with 40 other recipes. 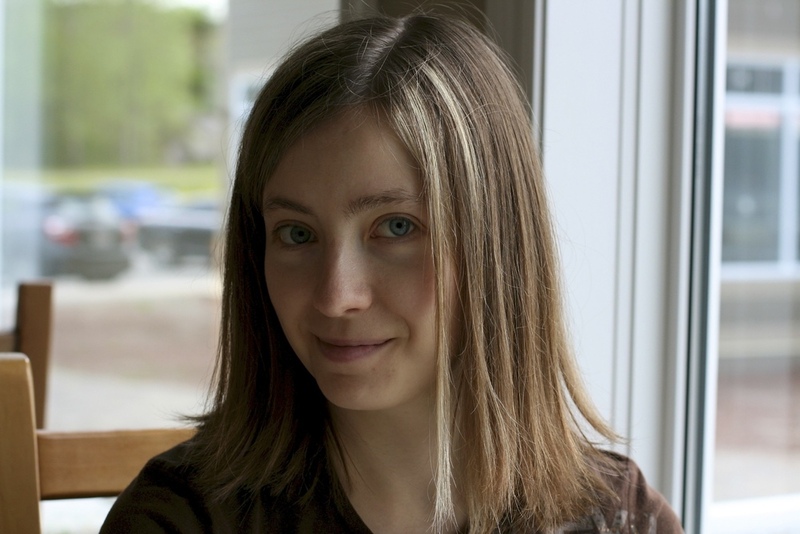 I'm not sure how much info I can giveaway, but the FOODIE cookbook app has previously been featured in USA Today, Mashable, and Consumer Reports. I'm super excited! I will definitely post a link when I have one. Now let's get to the next post in my gluten free Great Grain's series. If you aren't caught up yet here are my previous posts on Buckwheat and Millet. This tiny little seed is one highly nutritious gluten free grain. While it may look like millet or quinoa, I assure you it's not. Amaranth is actually quite smaller in size and whiter in colour. We're talking teeny tiny! It has a slightly sticky texture when cooked the traditional way in liquid, is nutrient rich, and high in fiber. It also has a high concentration of lysine, an essential amino acid (one of the building blocks of protein). For a bit of historical fun, it dates back 8,000 years to when it was used by the ancient Aztecs as food staple. Personally it's one of my fave gluten free grains. I love the texture, taste and versatility of it. Even more so I love it's nutrition. You've gotta love slow digesting carbs for stable energy and blood sugar. With high amounts of protein, fiber, calcium, lysine, iron, manganese, magnesium, phosphorus, potassium, vitamin B2 and folic acid you can't go wrong. 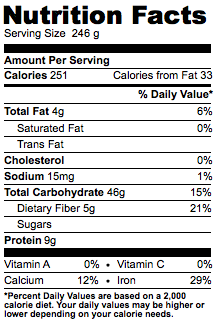 It actually contains more protein than any other gluten free grains and more protein than wheat. In fact, the protein content of amaranth is similar to the proteins found in cow's milk. It's a complete protein, meaning it contains all essential amino acids, including lysine, which is lacking in most other grains. Bottom line - amaranth is an excellent plant source of high quality proteins that are well absorbed when eaten. Take that quinoa! Just kidding, I still love you quinoa. 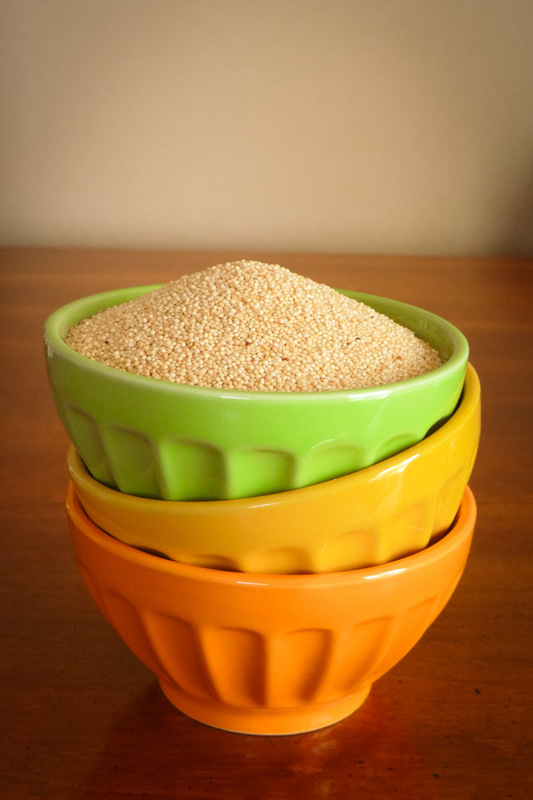 With a low glycemic index, amaranth is also slightly lower in carbohydrates than other gluten free grains. Like other gluten free/ specialty grains it's not easily found in grocery stores. I find it in the healthy food store or of course Whole Foods and specialty grocery stores like Nature's Emporium. Here the link to buy online from one of my favourites Bob's Red Mill; buy organic amaranth online. Just prior to cooking, rinse and strain your amaranth throughly in cold water until the water runs clear to remove any dirt. To cook, boil 1 cup of amaranth in 2 1/2 cups of liquid such as water, vegetable or chicken stock, or milk of any kind (cow's, coconut, almond etc). Reduce heat and simmer for 18-20 minutes until tender. Fluff with a fork a serve. Take care not to over cook it as it can become "gummy" in texture. Keep amaranth stored in an airtight container in a cool, dry place, out of direct light. When stored in the fridge it will keep for 3 to 6 months. Get grinding and make some flour! 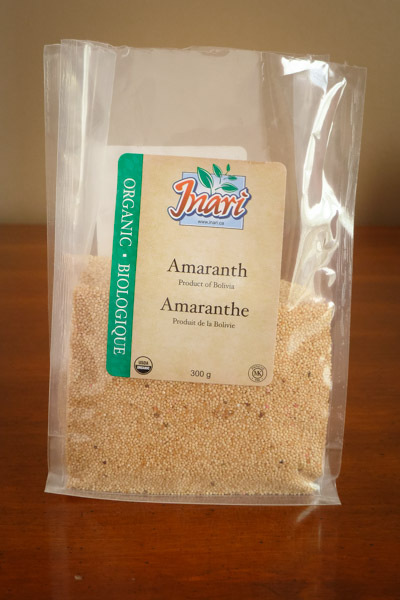 Amaranth makes a sweet, spicy, earthy, nutty flavoured flour best used in waffles, pancakes, cookies, muffins and quick breads. Just don't use amaranth flour exclusively in gluten free baking because your end result will be too dense. You'll need to blend it with a variety of gluten free flours, especially for baking yeast breads and cookies, pancakes should be okay though. By nature, amaranth absorbs water very easily making it a good thickener for soups with added nutrition. It can be cooked as a cereal and used as a replacement for oatmeal. Sprouted and placed in salads. Toasted is another great way to use amaranth. Just toast and add to yogurt, smoothies, trail mix etc. My personal favourite is popping the tiny seeds like popcorn... Post to come! Happy Easter everyone!!! Have a great weekend.